Rent a kayak for a few hours or several days. We have kayaks that are suitable for beginners and intermediate level paddlers that prefer stability to speed. 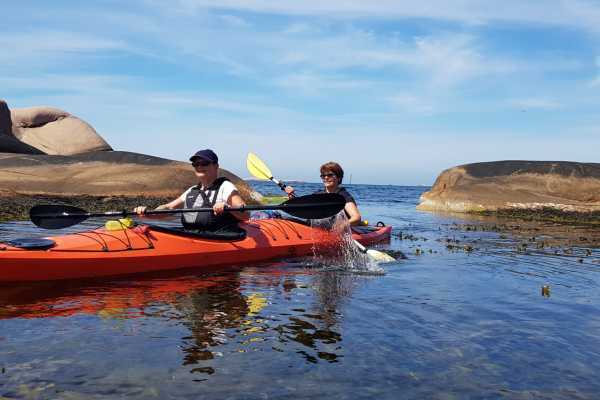 We also offer several guided tours every week which is a good idea if there is no one in your party that has adequate knowledge/training in ocean kayaking (open sea paddling). There is also an opportunity to book an instructor in conjunction to the release of your kayak rental. These intervals can vary depending on day of the week and when during the season. We usually have open hlaf an hour prior to departure or directly after return of a guided trip, provided there are bookings for rental equipment or guests on the tour. Normally we will be closed on such an occasion if there are no bookings (unless on days with OK weather during peak season). Look up our opening hours (for pick up of your pre-booked equipment) via the calendar at the end of this page. If there are no time slots available on a specific day you may also send a booking request. During off season ans low season we have no scheduled time slots but make individual agreements with those that book rental gear. Welcometo the "not too wild" West. The soft granite crags along the coast of Bohuslan, on the West Coast of Sweden is very inviting for sunbathing and exploration of the littoral zone. But after a quick change of the weather they can be just as relentless. Just a few minutes of paddling off the docks of Lysekil you find tranquility and peace of mind. Just you and the sea, some herons, jumping herring, mackerells, minks, seals and waterfowls. Skilled paddlers can enjoy the outer archipelago on their own. But please keep in mind that if you bring less proficient friends along you will have an extra large responsability for their wellfare. Using sturdy kayaks and sticking to less exposed waters lets everyone enjoy the experience. Please note that the coastal weather can change in an instant. The direction of wind and waves can change during a short break, especially at mid day. Do not over estimate your own skills and the ability to handle emergencies among companions. At least one person in every party ought to have experience in leading and executing rescue and recovery procedure of a companion that has capsized. Adjust your route in accordance with the level of proficiency of the least experienced member of your party and the weather forecast.